Twingo’s past success – with more than 2.4 million models sold worldwide since the original release in 1993 – is not stopping it from moving forward... by getting back to basics. 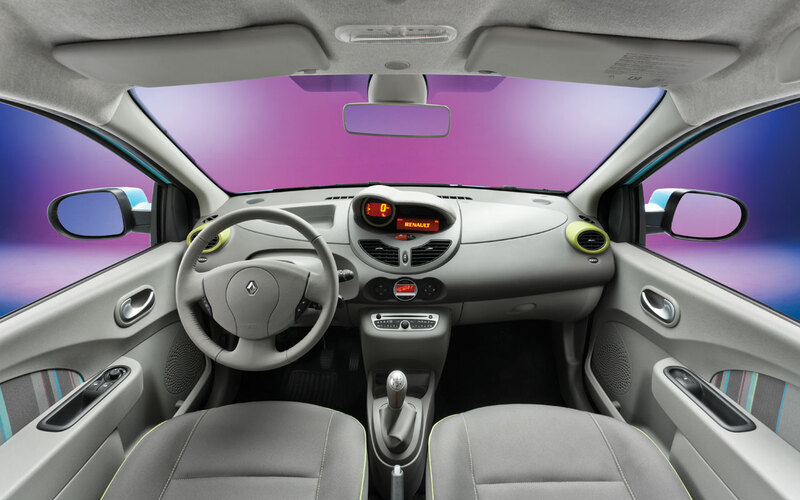 Blending the funkiness of the original Twingo with the latest automotive innovations, New Twingo is fresh and fun. A trendy urban pop design, a modular interior with connectivity, and impeccable ef!ciency on the road are the key concepts behind this city car. Ready to wow customers who are increasingly demanding when it comes to appearance and fuel consumption, New Twingo anticipates contemporary needs without losing any of the charm that made Twingo I so successful... The 2011 version is like a “Best of Twingo”. New Twingo has a familiar friendly face, with an enlarged vertical Renault logo. The almondshaped headlights are boosted by fog lights in the same child-like shape as the headlamps of Twingo I, giving it that cute, mischievous expression. New Twingo has kept up the tradition of a likeable front end that says joie de vivre... and driving fun! To underscore the cheeky playfulness that made the !rst Twingos so appealing, the position lights have been set up above the headlights like twinkling eyelids: a subtle wink in town, a lingering glance for a ride away from the madding crowd, and high beams on the open road ... The main tail lights are boosted by functional extra lights, which highlight the hatch, echoing the front end, and add roundness and tone. With a rounder rear bumper and a curved hatch, the overall lines are softer. And as a bonus track, the 24 wheel and center cap designs available include a new aerodynamic wheel with an assertive style (black diamond) that economizes on fuel and hugs the road. 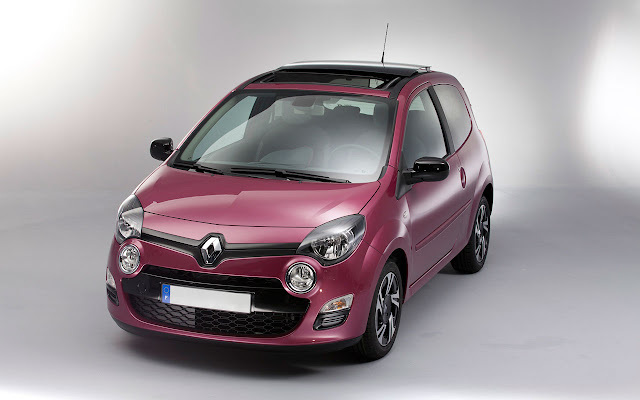 Running on petrol or diesel, Twingo engines turn Renault’s city car into a fully-#edged roadster. The 1.2 TCe 100 bhp engine delivering high torque (155 Nm maxi) at low revs, offers the driving pleasure of a larger engine without the extra fuel consumption. The emblematic Twingo engines, like the 1.2 16v petrol 75 bhp and the 1.5 dCi diesel 75 and 85 bhp have undergone continuous improvement. Together with simultaneous aerodynamic optimization, this has signi!cantly reduced consumption and pollutant emissions, without compromising on driving enjoyment. New Twingo’s fuel consumption (3.4 l with the 1.5 dCi) puts it at the top of its class. In terms of the environment, Twingo attains benchmark emissions levels: the target is 85g of CO2 for the diesel dCi 75 and 85 bhp and 102 g for the 1.2 16v 75 bhp petrol in 2012! On the road, New Twingo is the best in its class for road holding and comfort. It has all the qualities of a roadster and even offers higher fuel autonomy. In economy mode, a full tank lasts 1,000 km with a diesel or 750 km with a petrol engine. Mainly a city car, New Twingo takes advantage of its compactness and maneuverability to weave in and out of traf!c and reverse into tight parking spaces, with a Twingo attitude that leaves the competition for dead! 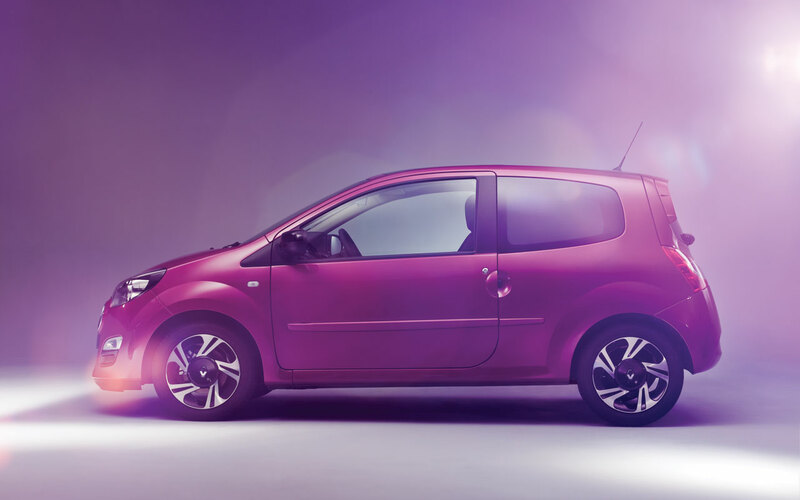 In the city or on the open road, New Twingo is a zippy, handy car for people on the move!